FRAMINGHAM, Mass., December 21, 2017 – According to the International Data Corporation (IDC) Worldwide Quarterly Converged Systems Tracker, worldwide converged systems market revenue increased 10.8% year over year to $2.99 billion during the third quarter of 2017 (3Q17). The market consumed 1.96 exabytes of new storage capacity during the quarter, which was up 30% compared to the same period a year ago. "The converged systems market expanded on multiple fronts, most notably within hyperconverged solutions," said Eric Sheppard, research director, Enterprise Storage & Converged Systems. "While hyperconvergence is not the sole source of market growth, it has undeniably driven an expansion of this market into new environments at a very rapid pace." 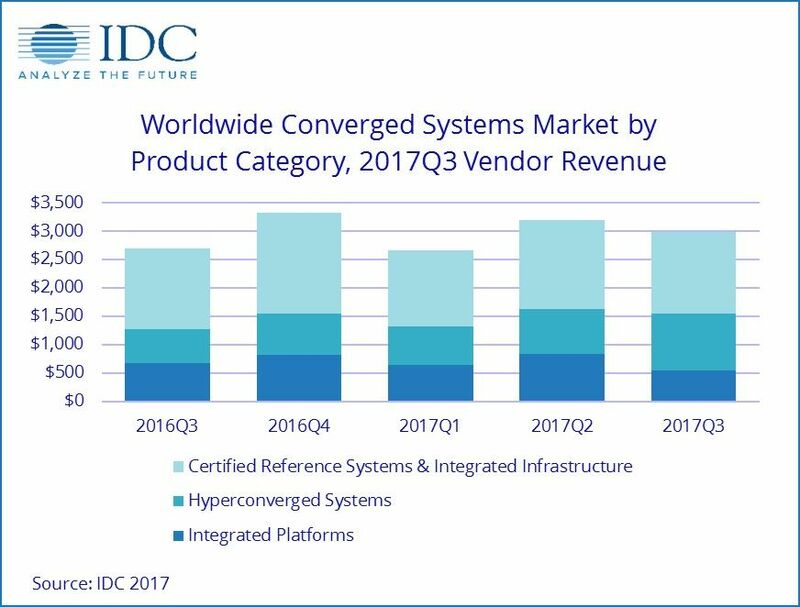 IDC's converged systems market view offers three segments: certified reference systems & integrated infrastructure, integrated platforms, and hyperconverged systems. Certified reference systems & integrated infrastructure are pre-integrated, vendor-certified systems containing server hardware, disk storage systems, networking equipment, and basic element/systems management software. Integrated platforms are integrated systems that are sold with additional pre-integrated packaged software and customized system engineering optimized to enable such functions as application development software, databases, testing, and integration tools. Hyperconverged systems collapse core storage and compute functionality into a single, highly virtualized solution. A key characteristic of hyperconverged systems that differentiate these solutions from other integrated systems is their scale-out architecture and their ability to provide all compute and storage functions through the same x86 server-based resources. During the third quarter of 2017, the certified reference systems & integrated infrastructure segment generated revenues of $1.44 billion, which represents a year-over-year increase of 1.5% and 48.3% of the total converged systems market value. Dell Inc. was the largest supplier in this market segment, with $697.2 million in sales and a 48.3% share. Cisco/NetApp generated $485.5 million in sales, up 56.4% (Y/Y) and representing the second largest share of 33.6%. *Note : Dell Inc. represents the combined revenues for Dell and EMC sales for all quarters shown. Hyperconverged systems sales grew 68.0% year over year during the third quarter of 2017, generating $1 billion worth of sales. This amounted to 33.5% of the total converged systems market revenue. Dell Inc. was the largest supplier in this market segment with $306.8 million in revenue and a 30.6% share. Nutanix generated $207.4 million in revenue with the second largest share of 20.7%. As with all other segments of the converged systems market, vendor shares within the hyperconverged systems market segment are based on the brand of the solution. Sales of fully integrated solutions built with intellectual property from multiple suppliers, but branded by only one supplier, are attributed to the supplier branding the solution. Integrated platforms sales declined 19.8% year over year during the third quarter of 2017, generating $542.7 million worth of sales. This amounted to 18.2% of the total converged systems market value. Oracle was the top-ranked supplier of integrated platforms during the quarter, generating revenues of $240.4 million and capturing a 45.8% share of the market segment.